Bedford Blues are delighted to announce that ex-England international scrum half Lee Dickson is joining the club as a player/coach for the 2017/18 Championship season. Dickson, 32, makes the move to Goldington Road having played 250 games for Northampton Saints since joining from Newcastle Falcons in 2008, with only Stephen Myler and Dylan Hartley having made more first team appearances for the Saints out of the current squad. 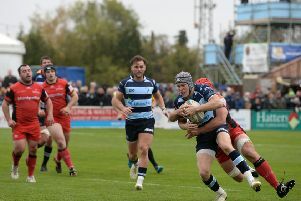 Speaking about the capture, Blues Director of Rugby Mike Rayer said: "To be able to sign a player of Lee's quality is a real coup for the club and everybody is excited to welcome him and his experience to Goldington Road. "Lee could easily have stayed in the Premiership but he has a desire to progress in coaching while continuing to play and Bedford is the perfect place for him to do so. Not only does this give us a great option at number nine, but young players will learn so much from him very much like Will Chudley and Ali Price did under the tutelage of Nick Walshe a few seasons ago. "I'm sure that the Bedford Blues faithful will be delighted with this signing which shows a clear intent from the club to push on in the Championship next season." Dickson, who captained the Saints for the 2015/16 season, said: "The move came about because of my brother. I was thinking about what I wanted to do in the next couple of years, whether that was continue playing or having a look at other things and I was chatting with Karl who mentioned that Bedford would be the perfect fit for me. "Karl spoke to Mike Rayer, I then had a chat and arranged to come down to talk things through and after an hour of being at the club I made my mind up. "Northampton will always be in my heart as it is a club I've played for for nine years but this is professional rugby and you have to look to the future rather than the past. I'm looking forward to the next chapter of my life with Bedford Blues. "Bedford play a great brand of rugby here which really suits me. We played against the Blues a few weeks ago and at times they ran us ragged so I'm really excited about being involved. There's a very talented backline at Bedford and I hope that I can pass on some of my experiences to these guys."